On this day in history, 1886, people flocked to New York City in droves. Every train entering the city was filled to capacity. New York’s many hotels, from the most exclusive to the most humble, had to turn away hundreds seeking lodging. No-one wanted to miss the grand ceremony of President Grover Cleveland dedicating the Statue of Liberty in New York Harbor. The late October day was a raw one featuring drizzle and heavy fog, but it did little to dampen the spirits of the crowd. The ceremony included speeches by the President and French engineer Ferdinand de Lesseps, who was the then head of the Franco-American Union. The band played such rousing American favorites as “Yankee Doodle Dandy” and “The Star Spangled Banner.” A gun salvo and a benediction rounded out the preliminaries. The moment everyone was waiting for was when Frederic-Auguste Bartholdi, the statue’s designer who was hidden in the torch, tugged a rope that pulled away the French flag covering the statue’s face, revealing her countenance to the American people for the very first time. We will not forget that Liberty has here made her home; nor shall her chosen altar be neglected. The friendship between the United States and France began during the American Revolution, when France chose to aid the treasonous American colonists against their former overlords in Britain. This was a dangerous move for a country that had a monarchy of its own, but in the end the French hatred of the British won out and they were happy to aid those who were actively set against Britain at the time. In 1865, French historian Edouard de Laboulaye put forth the idea that a tangible sign of the two nations’ friendship would be a lovely idea, and proposed the idea of a statue. He then founded the aforementioned Franco-American Union to raise funds for the project. In the United States, in an effort to shame people to pony up for the project, Joseph Pulitzer ran scathing editorials in his newspaper The World accusing the wealthy of not funding the cause, and pointed fingers at the middle class for expecting the rich to carry the entire burden. Apparently he made everyone feel like dirt, as enough money to finance the pedestal (the expected American share of the project) was raised by August 1885. 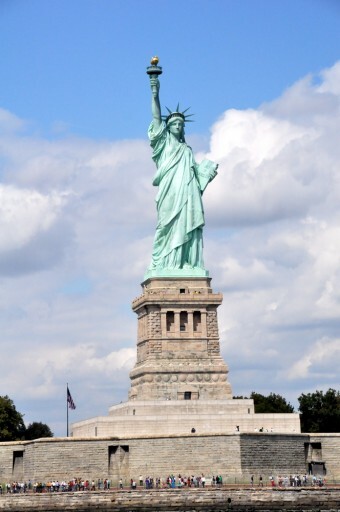 The statue, designed by Frederic-Auguste Bartholdi with steel supports engineered by Alexandre-Gustave Eiffel- yes, that Eiffel- was shipped to New York in many pieces. When it arrived in June 1885, it was assembled on Bedloe’s Island – later renamed Liberty Island in 1956.